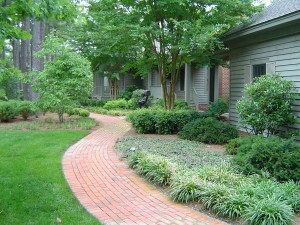 One trick to making a richly planted yard feel more manicured is to add a smartly defined piece of hardscaping. Patios and paths or an upgraded driveway not only define space but also provide the kind of contrast that makes a flower bed or lush lawn pop. But if traditional surfacing materials leave you feeling as flat as poured concrete, consider pavers. F. A. Hobson Landscaping patio, walkway, and driveway paver installation services include a huge variety of shapes, colors, and patterns to give you a nearly limitless number of choices. The styles you choose for your outdoor landscaping projects are a great way to express yourself and we can make it all a reality. FA Hobson offers permeable paver design and installation on Maryland’s Eastern Shore that combines pleasing aesthetics and superb durability in an environmentally-friendly package.